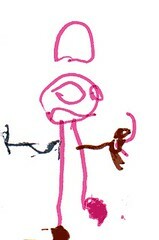 This is a picture Mia drew. She said, "It is a picture of daddy and he is mad at his computer because it is broken." I guess she knows what a geek I am, but I have a relatively new computer and it has not been broken, ever. Hmmm.